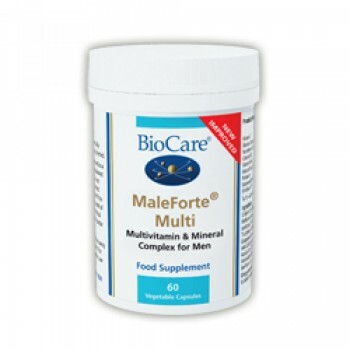 MaleForte® Multi is a high potency multivitamin & mineral complex, suited to the special requirements of men. It contains high ratios of nutrients including B Vitamins, Vitamins C, D, E, Zinc, Lycopene, Ginseng and Grapeseed Extract. Magnesium Citrate, Vitamin C (as Magnesium Ascorbate), Potassium Citrate, Capsule Shell (Hydroxypropyl Methylcellulose), Korean Ginseng (Panax ginseng Root),, Pantothenic Acid (as Calcium Pantothenate), Zinc Citrate, Niacin (as Nicotinamide),Vitamin E (as D-Alpha Tocopheryl Succinate), Modified Tapioca Starch, Soya Oil,, Thiamine (as Thiamine Hydrochloride) Vitamin B6 (as Pyridoxine Hydrochloride),Riboflavin, Grape Seed Extract (Vitus vinifera Seed as Vitaflavan®),, Anti-caking Agents (Magnesium Stearate & Silicon Dioxide), Lycopene, Dicalcium Phosphate,Chromium Picolinate, Acacia Gum, Sunflower Oil, Sucrose, Corn Starch,, Copper Gluconate, Vitamin A (as Retinyl Palmitate), Microcrystalline Cellulose, Sodium Selenite, Folic Acid, Potassium Iodide, Vitamin B12 (as Hydroxycobalamin),, Antioxidants (Natural Mixed Tocopherols), Vitamin D2 (as Ergocalciferol).